Property Details: 3 Bedroom, 3 Bathroom Vacation Rental, sleeps up to 10. 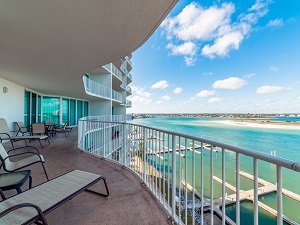 Caribe condo, beach resort home in Orange Beach. Spacious, luxurious, corner unit with incredible views! Huge floor plan with 3 large bedrooms, media room that sleeps like a 4th bedroom, and all new furniture, flat screen TV's (59' in the living room), Wii, and much more! Professionally decorated! !The unit has recently been redecorated completely with new paint, furniture, window treatments, TV's and more. It feels and lives like a brand new condo! You will love vacationing here!This unit is located on the 7th floor of the Caribe 'B' building and the unit has amazing views of the bay and Gulf of Mexico. Caribe is one of the best family vacation facilites on the Gulf Coast. Upon entering the resort through the 24 hour guarded gate, you'll enter a 23 acre paradise of lush natural landscaping and Caribbean styling that sets a special mood for your most relaxing and fun filled vacation ever. Caribe's amenities are world class. The kids will love the water slides at the three outdoor pools and everyone will enjoy floating on the 'Lazy River.' Indoor pools, jacuzzis, saunas, steam rooms, fitness center, tennis courts and a 10,000 square foot golf putting green are just a short elevator ride away. Caribe Resort Condo Rental in Orange Beach AL.